Pets are the silent victims of domestic violence. And now they will be protected for the first time. 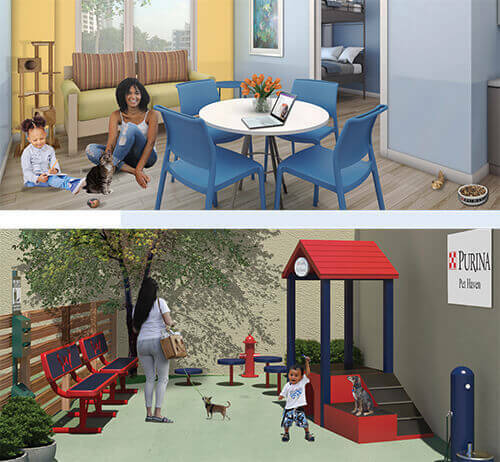 This fall, a seven–story domestic violence shelter designed for ALL domestic violence survivors, including family members with four legs, called PALS (People and Animals Living Safely) Place will open in Brooklyn. There will be 30 apartments, all pet friendly—the first facility of its kind in the U.S.
He’s referring to both human and animal lives. “If we stayed much longer, Downey would have been abused for sure, and our lives—all our lives—were at risk,” says Brenda. The family had two cats, and when the first cat was abused, she relinquished her to an animal shelter. But when he threatened their second cat, she just couldn’t bring herself to further break up her family. But what was she to do? It seems she had nowhere to go with her other cat. “When I was accepted into Urban Resource Institute (URI), I jumped up and down like a little kid. I knew if Downy could be safe, we all could be safe,” Brenda exclaimed. PALS Place will be a part of Urban Resource Institute (URI), the largest provider of domestic violence services in America. Currently, URI does make some space for people and pets available in their existing facilities. Over 70% of domestic violence victims report that their pets were either threatened, harmed or killed by their abuser. “While it’s great that we provide pet friendly spaces, far more than most cities; there’s clearly an overwhelming need and our goal is to move toward meeting that demand,” says Nathaniel M. Fields, president and CEO of URI and Center Against Domestic Violence. No one knows how many pets actually die as a result of domestic violence, but we do know that over seventy percent of domestic violence victims report that their pets were either threatened, harmed or killed by their abuser. “Today we understand that veterinary professionals can be on the front lines for all of this,” says veterinary forensics pioneer, Dr. Melinda Merck, author of Veterinary Forensics: Animal Cruelty Investigations, 2nd Edition and co–author of Veterinary Forensic Investigation of Animal Cruelty: A Guide for Veterinarians and Law Enforcement. “Of course, there may be physical signs of animal abuse,” says Merck. “But think about hidden injuries, like rib fractures. Another sign not always thought about may manifest in behavior issues,” she says. 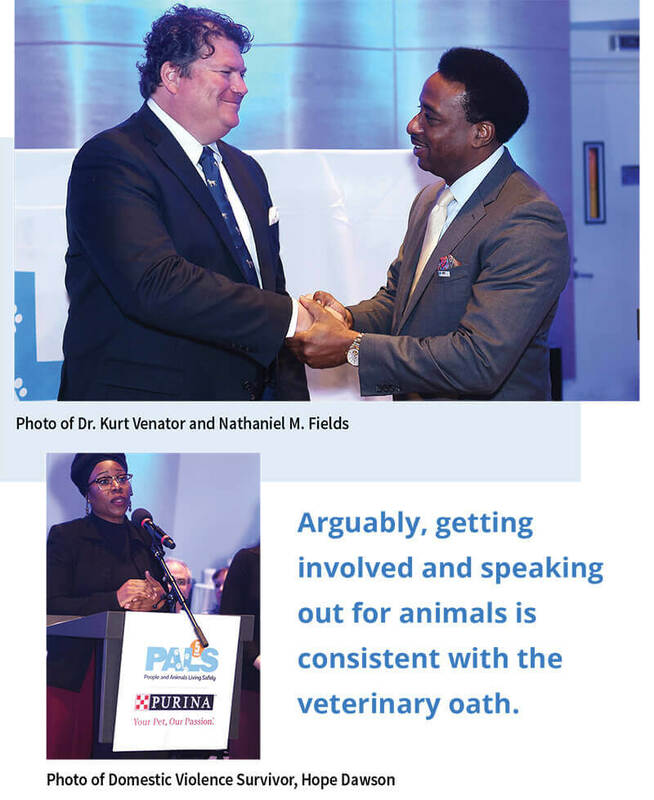 Arguably, getting involved and speaking out for animals is consistent with the veterinary oath. HABRI (Human Animal Bond Research Initiative), Purina, Bayer Corporation, Pet Partners (the nation’s largest nonprofit registering handlers of animal–assisted interventions), Noah’s Animal House and URI have formed a coalition to support the passage of the Pet and Women Safety (PAWS) Act (H.R. 909, S.322), a bill that is adamant about removing a roadblock that is essential to the safety of these survivors with pets by enabling them to live healthy, safe lives, together with the entire family. Noah’s Animal House and URI are part of the just three percent of domestic violence shelters across the country who are working to keep both pets and their owners away from the dangers of domestic abuse. Together, these two incredible organizations have saved more than 1,500 pets from abusive conditions, so that no domestic violence survivor is forced to choose between staying in an abusive relationship and leaving their pet with their abuser or an animal shelter. “And let’s not ignore pets’ ability to help us to feel better, and even to heal,” Venator adds. PALS Place won’t only be a building that allows pets—the building itself is being created with pets in mind. “We’ll offer more than just cute boxes filled with toys, pet food, pet treats, a dog and/or cat crate, cat litter, litter boxes, leashes and collars to all of the dogs and cats. From the ground up, everything is in consideration of pets and people living better together, from the flooring to the consulting of our experts on color palates,” describes Venator.